In September 2018 news was given in the Brontë Society Gazette of the recent successful finding of a pencil drawing by Emily Brontë in Dallas, reported by email. To announce the news Sarah Laycock, the curator of the Brontë Parsonage Museum, who after the necessary checks to ensure the authenticity of the object in question and with the opinion of experts such as Ann Dinsdale and Jane Sellars, contributed with many difficulties to the transport of the drawing from America to the UK and its restoration. It was then displayed in the bicentennial year of the birth of Emily in the museum to be admired by visitors from all over the world. The design in question is entitled 'Ancona' and is signed 'E.J.Brontë 1835', as usual for the author and the sisters on the sidelines of all their figurative and literary works. It represents the Arch of Trajan, an important monument of Roman origin located in the Italian city of Ancona near the port and close to the hill where the Duomo of S.Ciriaco stands. One wonders how and why Emily Brontë wanted to reproduce with her own pencil a monument she had clearly never seen, located in a place that she could not even imagine visiting. 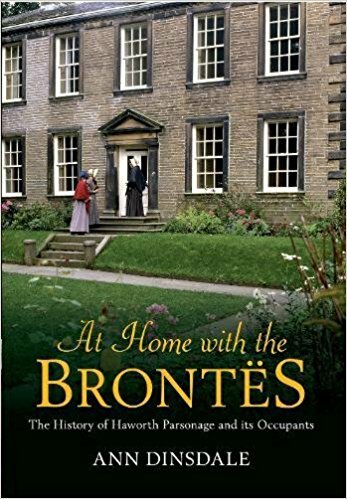 In fact, the four Brontës especially in their youth often copied images from books and prints and delighted in building stories around them with unparalleled imagination. Many of their artistic products, from the hands of Charlotte, the sisters as well as Branwell, are very accurate copies of illustrations taken from books they possessed or borrowed. Emily copied her drawing entitled 'Ancona' from the print contained in the book Life and works of Lord Byron by John Murray, a grandiose work articulated in several volumes and published in 1833. The print was by a certain Edward Francis Finden and reproduced a drawing of Samuel Prout (1783-1852), at the time one of the main masters of watercolors depicting architectural monuments. 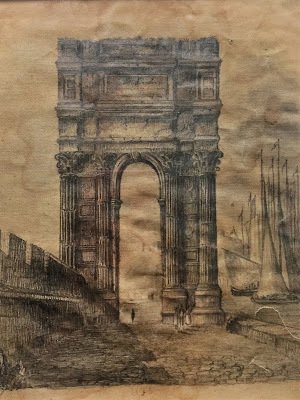 Since he had the opportunity to stay in various European countries including Italy, he painted various sketches of the most important monuments he had admired in his travels. 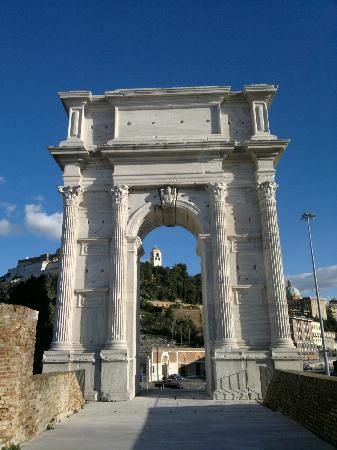 The Arch of Trajan in Ancona dates back to 114-115 AD, and it is named after the Roman emperor who built it. It was an example of gratitude for the man who had given the Doric city a port, thus allowing it an important commercial life on the Adriatic and to the east. 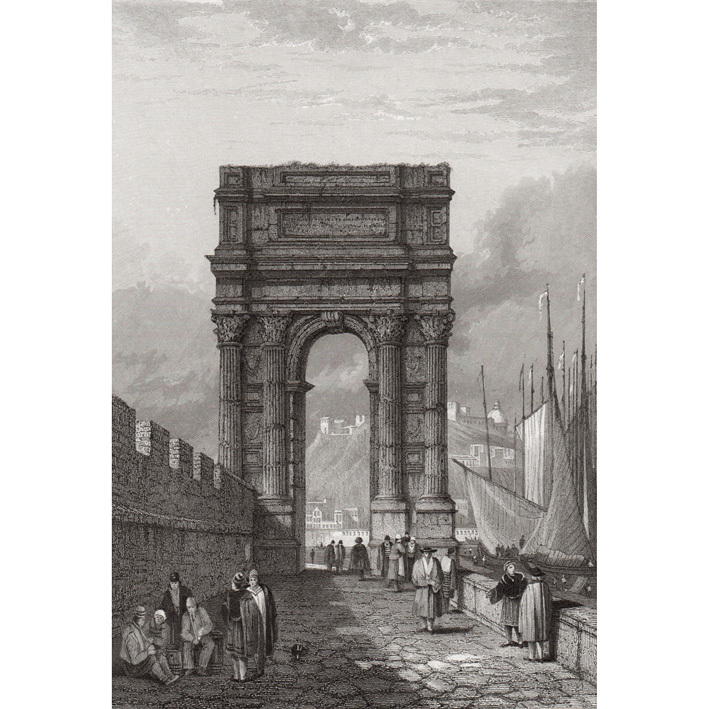 The English essayist Joseph Addison (1701) spoke of the Triumphal Arch of Ancona, built in honor of Trajan, located near the sea in white marble and exposed to winds and sea air. Why did Emily choose to reproduce the drawing from this print? Was she attracted by the imposing arch or by the fact that it was a tangible proof of the greatness of the ancient Romans? Would she have liked to see it in person? Analyzing at the same time the drawing of Emily and the print of Finden taken from Prout I can immediately notice the almost complete elimination of the crowd of people walking near the Roman monument. Emily thus emphasizes the Arch which, by itself stands out in the centre of the image appearing closer to the observer than it is in the drawing reproduced in print. For this purpose, the details of the hill with the cathedral beyond the Arch, well outlined in the press, are almost absent in Emily’s drawing. I even hypothesize that Emily's interest in Ancona finds an echo in the name 'Alcona', one of the four provinces of the fantastic kingdom of Gondal she created, whose queen is A.G.A., otherwise known as Rosina from Alcona, as Fannie Ratchford stated. Since I was born just in Ancona and although I have not lived there except for the first six years of my life, I am still very attached to my hometown of which I have a vivid memory. Often as a child I found myself walking with my father right under the Arch of Trajan, without even imagining that a few years later I would have been fascinated by the English literary family to whom I have dedicated myself for a lifetime. Learning today that my Emily reproduced with such alacrity a very important monument of Ancona from a print found in nineteenth century England produces in me great enthusiasm. And it naturally leads me to meditate on the curious coincidence that binds me further to this unpredictable author so dear to me. The programme for this recital was devised by John Hennessy and presented at Ponden Hall on Monday 8 October 2018. Music: Beethoven, Clementi, Haydn, Kalkbrenner, Pinto, Schubert, Traditional. 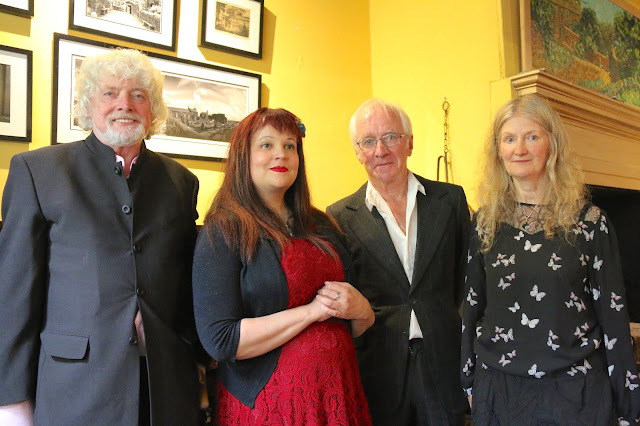 Several members of the Brussels Brontë Group attended the Brontë Society’s 2018 weekend of events in Haworth, this year celebrating Emily Brontë’s bicentenary. Our group included Guy and Evy Desloovere-Van de Voorde with their 8-month-old son Arthur Branwell – his first visit to the village of the family that inspired his name! After an invitation to join Brontë Society trustees for chat, tea and cake in a restaurant in Main St, the weekend’s events kicked off with a presentation on the Brontë Parsonage Museum, now 90 years old. Ann Dinsdale, Principal Curator, and Jane Sellars, a former Director, talked us through highlights in the Museum’s history. Ann Dinsdale is the author of numerous books including At Home with the Brontës: The History of Haworth Parsonage & Its Occupants and The Brontës at Haworth. 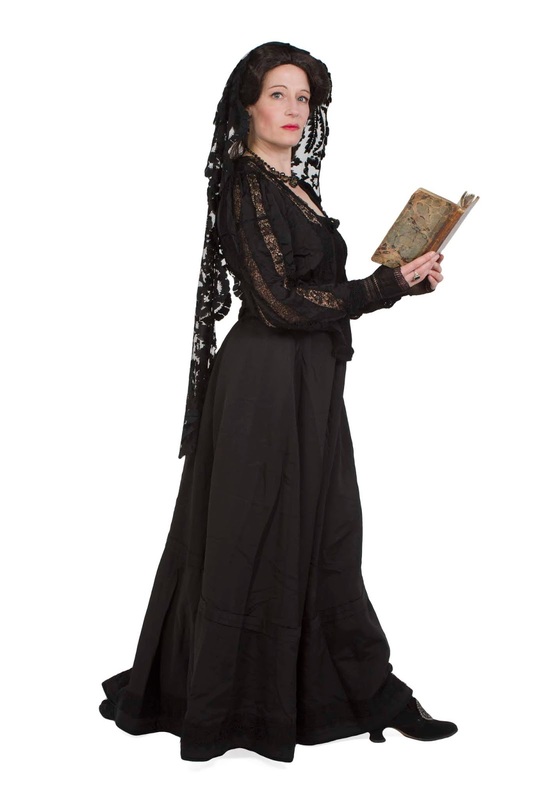 After dinner we were regaled by ‘an evening of all things Gothic’, a highly dramatic and hilarious one-woman entertainment by the amazing Lucy Adlington of the History Wardrobe, who commented on – and in some cases modelled – the costumes on show. Her romp through the Gothic in literature was interlarded with readings from the Brontës’ novels and other works such as Jane Austen’s Northanger Abbey. 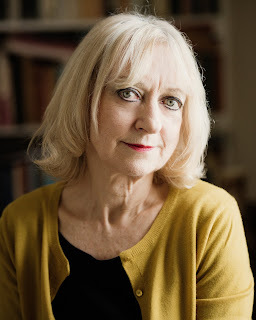 She is the author of several books on costume history. Saturday, the day of the Society’s AGM, is always packed with events. The first of these was a lecture on The Eccentricities of ‘Woman’s Fantasy’… and Heathcliff by Carol Dyhouse, a social history professor from the University of Sussex. Among other questions she looked at why Heathcliff is so often seen as a romantic hero and how far, if at all, this can be attributed to the novel itself as opposed to reinventions in screen versions of the book. 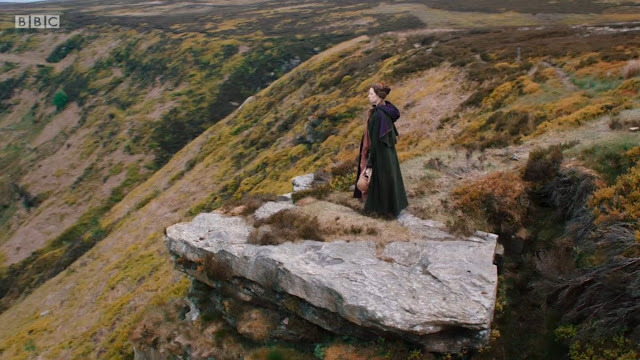 From the Gothic heroes of the Brontës’ novels and women’s fantasies to a sermon in the church where their father preached: the Brontë Society weekend certainly offers variety and a range of experiences. On Saturday morning – another tradition of the weekend – was a church service, led by the current Rector of Haworth, dedicated to the Brontës in the (rebuilt) church of St Michaels & All Angels. After lunch it was time for the Society’s AGM. The Society currently has around 1,800 members and employs over 40 staff at the Museum, which has just made a successful bid for significant Arts Council Funding as a National Portfolio Organisation. Possible future projects were discussed, for example the idea of turning a Victorian underground reservoir in Haworth into a centre for women’s writing. The perennial question of when the Museum is to build toilets for visitors also came up – when doesn’t it! At present visitors have to use the ones in the car park, threatened with closure. The day wound up with a quiz hosted by Lucy Mangan, journalist and co-presenter of the BBC documentary Being the Brontës (March 2016). The competitors included museum staff and Society members. Sunday was also a busy day. As usual, the museum opened at 9 a.m. for a private viewing by members. A highlight, continuing from last year which was Branwell Brontë’s bicentenary, is the recreation of Branwell’s bedroom, curated by creative partner Simon Armitage in collaboration with museum staff and the production team of the film To Walk Invisible. The installation, supposed to present the room as it might have been in the late 1830s when Branwell had ambitions to be an artist, features an unmade bed and artworks and other objects scattered in disorder. The morning programme consisted of Brontë Treasures (a private viewing in the Parsonage library of treasures in the Museum collection) and a talk by me on Charlotte Brontë’s legacy in Belgium, the subject of my new book Through Belgian Eyes. Thus our group and its work were well represented at Haworth this year. After lunch more energetic members joined a guided walk across the moors to Ponden Kirk, the rocky outcrop close to Top Withens supposedly the inspiration for Penistone Crag in Wuthering Heights. For those who didn’t feel up to this 9-mile walk there was a screening of the 1992 version of the novel with Ralph Fiennes and Juliet Binoche. A dinner and quiz rounded off the day. Jack Sharp - inspiration for Heathcliff? The closing event was an excursion to Halifax on the Monday. After a tour of the Piece Hall, there was a visit to Halifax Minster and the former Holy Trinity Church to view sculptures by Branwell Brontë’s great friend Joseph Leyland. David Glover, President of Halifax Antiquarian Society, gave us a talk on Leyland’s life. Over a splendid tea at Holdsworth House Hotel, he gave another talk on Law Hill School near Halifax, the story of Jack Sharp, a member of a local family who may have inspired the character of Heathcliff, and High Sunderland Hall, a building often cited as a possible inspiration for Wuthering Heights. 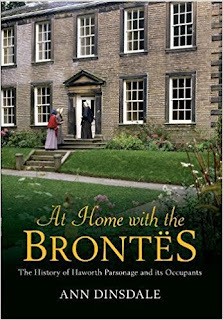 I hope that many Brussels Group members will join me for the Brontë Society weekend in Haworth next year (8-9 June) to enjoy a rich programme of events and spend time not just in Haworth but in local places with Brontë connections.